The desire for food and drink is perhaps the greatest desire about which we think most. It is certainly the one felt most physically and the one toward which we often put the greatest amount of effort toward satisfying. It is this desire for food and drink that led the Israelites to grumble against Moses and Aaron (cf. Exodus 16:2). It is this same hunger and thirst that led the crowds to follow Jesus (cf. John 6:24). Even so, there is something more happening in these passages than a simple physical hunger and thirst, for we use this desire for food and drink as a metaphor for other desires. We speak of a person’s thirst for power or of a hunger for wealth. Jesus, too, spoke in this way about "those who hunger and thirst for righteousness" (Matthew 5:6). Hunger and thirst, then, can be said to encompass all of our desires, all of our passions. When the Israelites grumbled against Moses, when the crowds followed Jesus, they were not simply looking for earthly food; they sought, rather, the satisfaction of their deepest yearnings and longings, even if they did not quite recognize it. They sought that which truly satisfies (and it was not a Snickers bar). We heard before that with the multiplication of the loaves and fish, everyone in the crowd "had eaten their fill" before the fragments leftover were collected (John 6:12). But this was not the purpose of this miracle; rather, Jesus intended to teach them something far more profound and important. If Jesus can satisfy their physical hunger so completely, how much more can he satisfy their spiritual hunger! It is of him that the Psalmist sings: "As the deer longs for flowing streams, so longs my soul for you, O God. My soul thirsts for God, for the living God" (Psalm 42:1-2). Toward the end of his life, Saint Thomas Aquinas, one of the greatest minds the Church has ever known, was writing a treatise on the Eucharist, struggling to complete it. In great frustration, the quiet man of God threw his text at the foot of a crucifix, asking the Lord what he thought of what he had written. The voice of God came through the figure of the Crucified Christ, saying to him: "You have written well of me, Thomas. What would you have?" Saint Thomas could choose whatever he wanted, whatever he desired. Would he ask for wealth or fame or power? Would he ask for love or athletic skill or simple pleasures? He could ask for anything; what would he ask of the Lord? He answered the Savior with these words: "Nil nisi te, Domine, nil nisi te. Only you, Lord, only you." The Angelic Doctor answered wisely and honestly. Saint Thomas "wanted nothing more than Christ, nothing other than Christ, nothing less than Christ." He knew that, as he had written earlier in his life, "God alone satisfies." I wonder, what would you or I ask of the Lord? Here at this altar he gives himself to us, the bread "which comes down from heaven and gives life to the world" and those who eat his Body "will never hunger" (cf. John 6:33; John 6:35). How is it, then, that so many come here week after week and leave hungry each time? How is it possible to leave here with a heavy and empty heart? The answer is simple: they do not recognize him; they do not adequately prepare themselves to receive him; and they do not believe that he wants to satisfy their every desire. What is more, they do not recognize in the Eucharist the very Body and Blood of our Lord. For if we recognized his Real Presence among us in the Eucharist, who would arrive late to Mass or leave before the dismissal; who would not come to the Mass dressed appropriately and modestly; who would receive Holy Communion in a sloppy or hurried manner; who would hesitate to show their devotion and love and spend time in prayer to prepare themselves; who would fail to confess their sins and receive absolution? Too many come here day after day never recognizing – or at least never admitting – their deep hunger and thirst for Christ! Because they do not know for what they long their hunger is not satisfied and their thirst is not quenched. Still hungering and thirsting they seek to satisfy their desires in the things of this world, and yet never do they find lasting satisfaction. But to those who receive the Body and Blood of the Lord Jesus Christ in faith, who have prepared themselves well to receive him, he addresses his promise: "I am the bread of life: whoever comes to me will never hunger, and whoever believes in me will never thirst" (John 6:35). In receiving him, they receive all they seek; they find in him lasting happiness, joy and peace. This Saint Thomas knew well and so he said, "God alone satisfies." My dear brothers and sisters, the Lord wishes to satisfy the true desire of our heart, if we but come to him in faith. If the Lord asked us, as he asked Saint Thomas, "What would you have," what would we ask of him? Would we ask for the things of this world – those things that promise to satisfy us but never do - or would we say with Saint Thomas, "Nil nisi te, Domine; only you, Lord"? Robert Barron, Thomas Aquinas: Spiritual Master (New York: The Crossroad Publishing Company, 1996, 2008), 12. Saint Thomas Aquinas, Expos. In symb apost, I. In Catechism of the Catholic Church, 1718. 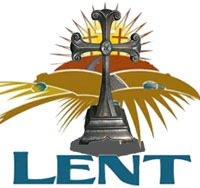 The Lent is meant to cleanse the whole being, both the inner and chemical by being with God. How to clean the physical man? The abstinence from food for hours and days allow the body to consume all the toxins accumulated by our day to day inherent infirmities. Fasting is acceptable to God when it is preceded by the great virtue of mercy; fasting prepares a reward in heaven when it is foreign to hypocrisy and vainglory; fasting works when it is joined with another great virtue – prayer. Lenten conversion is not a superficial renewal. What the Lord wants is not just the change of bad habits and worldly vices; He wants a clean soul and no half-measures will do. Fasting helps to have serenity of the soul because the one, who hungers in his stomach, enlightens his intellect. Therefore, the hunger is a key, which opens the door of wisdom.